This column has been printed in the February 2018 issue of Chess Life. A penultimate (and unedited) version of the review is reproduced here. Minor differences may exist between this and the printed version. My thanks to the good folks at Chess Life for allowing me to do so. Grivas, Efstratios. TP Endgame Academy: Bishop Endings, an Innovative Course. Gent: Thinkers Publishing, 2017. ISBN 978-9492510174. PB. Lakdawala, Cyrus. First Steps: Fundamental Endings. London: Everyman Chess, 2017. ISBN 978-1781944516. PB 272pp. Lund, Esben. Sharp Endgames. Glasgow: Quality Chess, 2017. ISBN 978-1784830397. PB 312pp. Mikhalchishin, Adrian, and Oleg Stetsko. Mastering Complex Endgames. Gent: Thinkers Publishing, 2017. ISBN 978-9492510112. PB 414pp. Don’t worry. I’m not going to get all epistemological on you, hard as it may be for this former philosophy teacher to restrain himself. There’s no exam at the end of your reading, and I’ll try to keep the ten dollar words to a minimum. Still, in writing this month’s column, I kept circling back to the question. We say we ‘know’ lots of things, but what does it mean to really know them? How can we verify that our beliefs are true and justified? The occasion for these musings was my most recent tournament outing, one of my worst in recent years. I should have recognized the ominous clouds on the horizon after my first game, where I self-immolated in spectacular fashion. And here, with plenty of time on the clock, I inexplicably lost my head. 61. 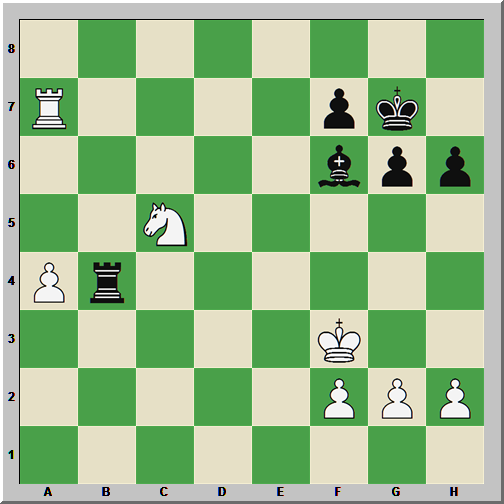 …Ra1 62.Kc5 Rc1+ 63.Kb4 Rb1+ 64.Ka3 Ra1+ 65.Kb2 Ra6 and White has nothing more than a draw. Did I “know” how to draw the game? It would appear not. But I had studied that exact ending – single rook, four pawns vs three, extra a-pawn – and, despite its being theoretically unclear, gotten a drawn position on the board. It was my practical knowledge, for lack of a better word, that was deficient. If only there was something that could help me improve my concrete endgame play. Endgame books have traditionally come in three main types. There are (a) theoretical encyclopedias (Dvoretsky’s Endgame Manual, for example) (b) manuals dealing with specific material configurations (Secrets of Pawn Endings by Müller & Lamprecht), and (c) books that aim to teach technique instead of theory (Endgame Strategy by Shereshevsky). To these we can add a fourth: the “workbook.” The widespread influence of Mark Dvoretsky’s training techniques have created something of a niche market for collections of difficult positions. Their purpose is to provide useful fodder for solving or ‘two-handed’ play, giving players a chance to put their theoretical knowledge into practice without risking rating points. Jacob Aagaard’s Grandmaster Preparation: Endgame Play is a fine example of the genre. An avalanche of new endgame books have appeared in recent months, and we’ll take a look at five of them here. We begin with yet another book by one of America’s most prolific authors, and – stop the presses? – I kind of like it. Regular readers of this column will know that I have been fairly tough on Cyrus Lakdawala, taking him to task for what I see as excessive and often useless verbosity. He has curbed some of these tendencies in his latest effort, First Steps: Fundamental Endings, and the result is a much tighter and satisfying read. Lakdawala’s book is part of the new “First Steps” series from Everyman, which (per the back cover) emphasizes “the basic principles, the basic strategies, [and] the key tricks and traps.” His explanatory skill shines in this book, but while the basics are well-treated in Fundamental Endings, I’m less convinced that he covers all the fundamental positions. The section on rook endings is typical of this difficulty, where some standard situations are underbaked or left untreated. Capablanca-Yates (Hastings, 1930) is a famous example where White manages to win with rook and three pawns versus rook and two pawns, all on the kingside. Lakdawala’s analysis is adequate, but improvements found in Averbakh – whom he cites – are missing. While it would have been strengthened by a more judicious choice of examples, First Steps: Fundamental Endings remains a very friendly introduction to the whole of endgame theory. With Bishop Endings: An Innovative Course, Efstratios Grivas takes a different tact, dedicating an entire book to the theory and practice of same-colored bishop endings. More precisely, Bishop Endings also covers endings with bishops against pawns, and bishops and pawns against pawns, but in terms of bishop and pawn(s) against bishop and pawn(s), only same-colored bishop positions are treated. This fact is nowhere to be found in the book or promotional materials. I discovered it by playing through the examples and wondering where the opposite colored bishops were! By narrowing his field of study, Grivas is able to bring great analytical focus to bear on these endings, and readers will certainly learn a lot about them. Those interested in endings with bishops of opposite colors, however, will just have to wait for a second book in the series. In contrast to the two titles just discussed, Mastering Complex Endgames by Adrian Mikhalchishin and Oleg Stetsko is a broad study of endgame technique. By “complex endgames,” the authors seem to mean those kind of positions that can straddle the line between late middlegames and multi-piece endgames. The book, whose closest read-alike is How to Play Chess Endgames by Müller and Pajeken, consists of eleven chapters that cover broad piece configurations (“Opposite Colored Bishops,” “Rook against Two Minor Pieces”) and typical endgame situations (“Structural Concessions,” “The Technique of Defending”). Mastering Complex Endgames was first published in Russian in 2012, and I suspect that this edition is a direct translation of that text. Very few post-2012 examples are included, and some of the older analysis seems not to have been engine checked. Indeed, as a rule I found that the older the position, the more likely I was to encounter analytical problems, with well-trodden classics being something of an exception. I have to admit that I was surprised by this finding. Mikhalchishin is a very well-known trainer and author with an excellent reputation. Perhaps part of the problem comes from his public distain for computer and tablebase analysis, both of which are essential in this day and age for analytical accuracy. As it stands Mastering Complex Endgames is a rich source for study material, but a healthy skepticism is warranted with some of the older positions. Silas Esben Lund’s Sharp Endgames is a very high-level example of the modern endgame “workbook” described above. 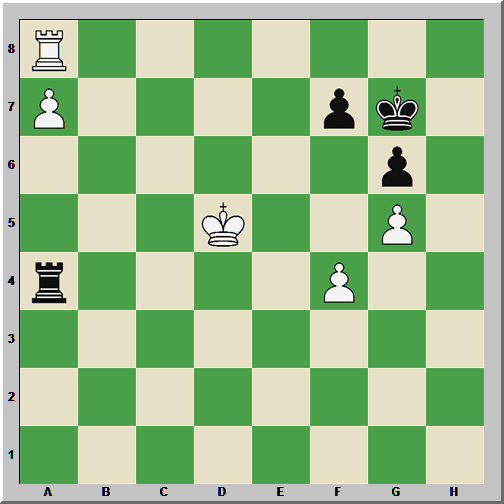 About half of Sharp Endgames is wrapped up in its third chapter, “Introduction to Endgames.” This material – covering theoretical knight (3.1), rook (3.2), bishop versus knight (3.3), rook against minor piece (3.4), and queen endings (3.5) – is of the highest quality, and it prepares readers for the real work of Lund’s book. Each of the 64 exercises in Sharp Endgames – readers are also encouraged to ‘solve’ the 33 examples in chapter three – are designed to be played out against another person or against the computer. Each exercise is coded with a suggested level and time control, and borrowing from the literature surrounding “deliberative practice,” Lund embeds a novel account of 16 subjective features of “critical moments” in his exercise solutions. Having written on the role of the computer in chess training myself – see US Chess Online for those articles – I cannot speak highly enough of Lund’s work here. Sharp Endgames is the first major title I have seen that outlines a thoughtful strategy for training against an engine, and Lund makes a persuasive case for the practical importance of such activity. The book is not perfect, of course. The 16 parameters can feel unwieldy and intimidating, and Lund wrongly attributes the theory of “deliberative practice” to Geoff Colvin. (It was Anders Ericsson who popularized it.) I also think it makes little sense to train against a modern engine at full strength when other, ‘lesser’ programs are available. But none of this should detract from what is a deeply original effort, and every player over 2000 should strongly consider the ideas in Sharp Endgames for their own training. Our final book this month, one perhaps better suited to the techno-phobic, is another endgame workbook: Chess Calculation Training Volume 2: Endgames, by Romain Edouard. This is actually Edouard’s third collection of problems, the above title notwithstanding, and the second in his current series. Volume 2: Endgames contains 424 problems across ten sections that are divided by task (“Find the Technical Win!,” “Find the Missed Move!”) and not by material. The positions run the full range of endgames, from multi-piece through tablebase territory, and the solutions are thorough and often mini-lessons in themselves. Many of the examples could be used in training sessions against the computer, although it is certainly not required, and class players will find Edouard’s problems perhaps more palatable than Lund’s. One of my old teachers once described reading the great American philosopher John Dewey as being akin to eating a bowl of oatmeal. It’s not the most exciting thing in the world, but it’s nourishing and will hold you in good stead for the rest of the day. Endgame study is, to my mind, much the same. While I am especially convinced that practical sparring a la Lund is of particular benefit, the best endgame books are those that you actually read. I hope that some of those listed above will be of assistance in your search for endgame knowledge… except, of course, in your games against me. This entry was posted in chess software, Endings, Instructional, training and tagged Adrian Mikhalchishin, Cyrus Lakdawala, Efstratios Grivas, Esben Lund, Everyman Chess, Mikhalchishin and Stetsko, Quality Chess, Romain Edouard, Sharp Endgames, Thinkers Publishing on February 1, 2018 by fullcityplus. I think the reason for your endgame failure in the game you posted can be found in your review of Thinking Inside the Box. I thought it was a decision making mistake. Thanks for the helpful reviews! Really appreciate you having the guts to use mistakes in your own games as examples.